Toddington Guest House is conveniently situated half a mile from Junction 12 of the M1, close to Luton and Dunstable, on the High Street, in the heart of the old village of Toddington. For those travelling on business or pleasure, we provide a unique homely atmosphere and friendly service, coupled with the convenience of the location. Managed by a local businessman who's lived in Toddington for over twenty years, we are able to provide advice and help on pretty much everything, including where to go, what to do and how to get there! Elegant and comfortable accommodation is standard, with all rooms having en-suite bathroom and television. A cooked breakfast is included and evening meals are available on request. 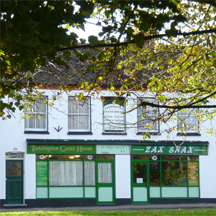 Our very own restaurant/take-away, Zax Snax, also offers a variety of snacks and fast-food until 10.00pm. We have ample off-road parking for your convenience and with the village shops close by everything is to hand. The guesthouse is situated next to the picturesque village green and opposite the village pond, so there's always somewhere to go when popping out for your evening stroll!